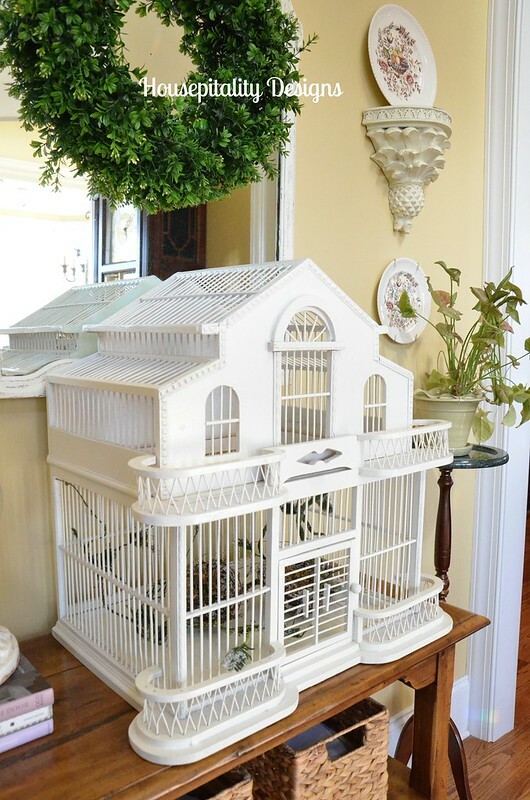 I have a “few” bird cages in the house . .
~ ~ as I love all things “birds”. They are giving me such a great feeling for Spring. In the great room . . .
~ ~ ~ there is even an “ice covered” vine and bird’s nest inside. In the master bedroom . . . In the sunroom . . . In the guest room, nestled in flowers . . . Does this “bird cloche” count??? And don’t miss out in seeing some fabulous ideas for Spring . . .
~ ~ join us on Monday, March 10th and Tuesday, March 11th. . .
~ ~ ~ ~ for sensational Spring inspiration!!! Love that round cage, Shirley! Of course, the cloche counts! I have a lot of birds around the house for spring but they aren’t working. We had snow yesterday and it was gray all day. But the sun did come up “tomorrow” so all is well. Have a great weekend. Love love love all your beautiful bird houses. They do scream Spring. I love your bird cloche. Super sweet. Have a beautiful week end. 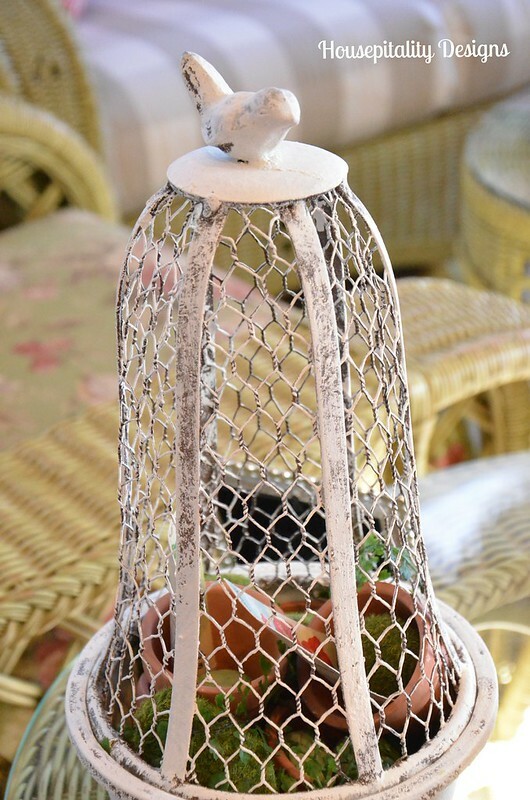 I love birdcages- you have some great ones! That first one is fantastic! I wish I had places to set such large ones. I love all your birdcages and YES, the cloche counts!!!! Hope you have a fabulous weekend. I’m so ready for spring! We have a really nice weekend on tap and I’m ready to enjoy. 🙂 Love all the bird cages, Shirley! 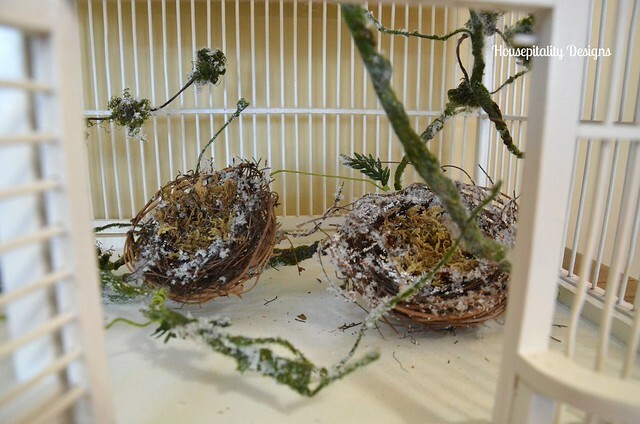 They are all fabulous….I love the little ice covered nests. Have a great weekend!!! Shirley all of these are gorgeous. That first one is spectacular. It’s size makes such a huge statement. Everything you do is so warm and inviting. Have a great weekend!! So pretty, Shirley! 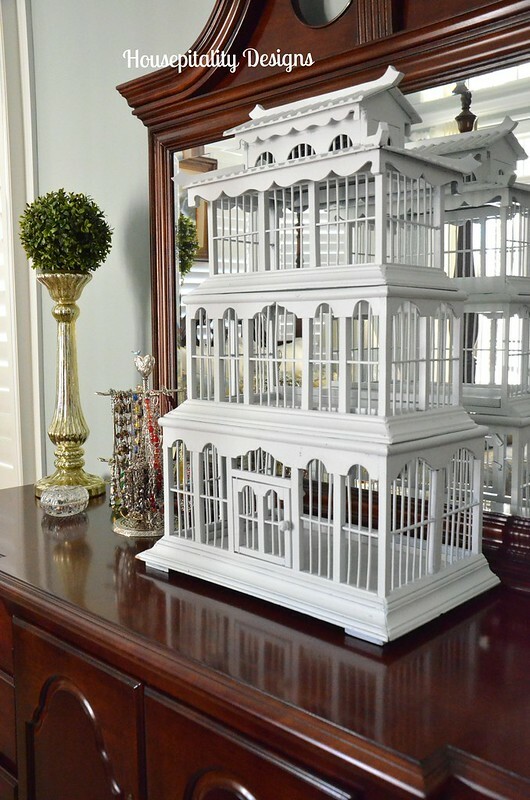 I adore your birdcages!You really have some show pieces! Your home looks so fresh and ready for Spring! Thanks for sharing your wonderful ideas! 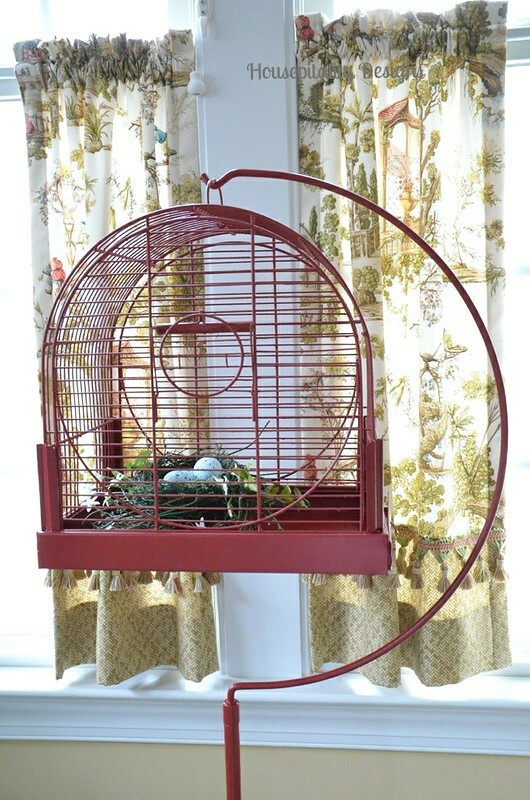 I love seeing how you’ve used your bird cages. I’ve collected them for years and they all sit atop kitchen cabinets where I enjoy them every day. Each one is very different which makes them a very fun collection. I love all your bird cages. I have quite a few also – need to get cracking and decorate them. I love the big white one – it’s so pretty. Have a great weekend. You have some bird cage beauties. I am on the lookout for a nice vintage one. You have a great collection of bird cages. I like the bird cloche myself. I guess this time of year we should begin to see the birds nesting outside too. That’s exciting. 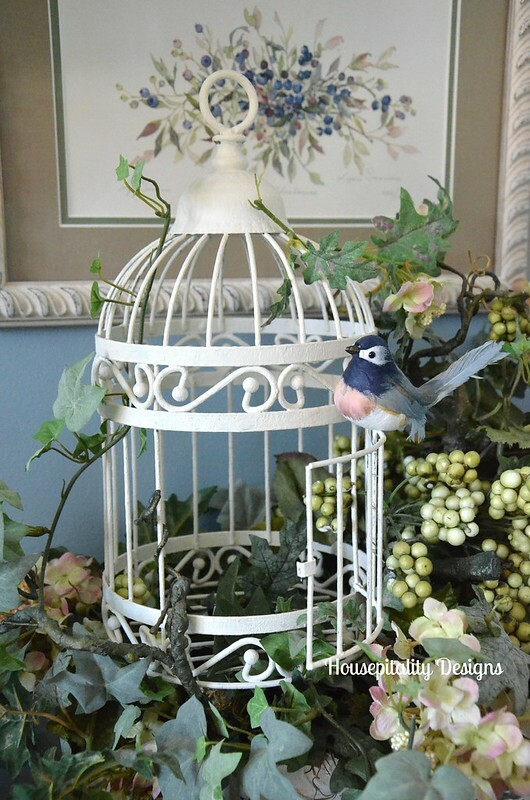 Nella@Acorn lane vintage living’s recent post…Collections and obsessions, and a recurring theme..
You have a wonderful collection of birdcages…the first one is my fav. Well, then we have some things in common, for I’m a bird-lover as well. Love your bird pretties! Beautiful bird cages Shirley. You have a nice collection and styles. Perfect for Spring! You have a great collection of bird cages, Shirley. I especially like the red one in your sunroom. Who doesn’t love bird cages? They’re so pretty Shirley, and you’ve displayed them in such creative ways. They’re beautiful, Shirley! What a fun collection, I love the different styles and statements they each make! What a nice collection Shirley. I especially love the little white one with the vines through it. You have that touch and make everything look so beautiful. Each one of them says something different.